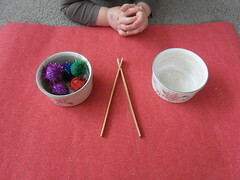 This week I re-introduced the use of chopsticks to the Oh Waily children. 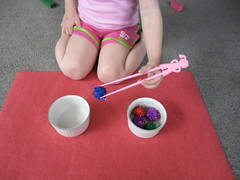 They have been shown these before, but neither of them seemed to have the motor skills needed to control them at the time. Naturally this caused some frustration and I therefore shelved the idea for a while. Since that first time, however, Gran Oh Waily found and sent down to us a whole bag of very nifty “throw-away” style bamboo chopsticks. These I thought would work best for Master Oh Waily. 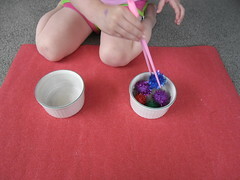 Take one small child, add two small bowls full of pom poms, a pair of flat bamboo chopsticks and place on a floor mat. Hope they wait long enough to take a photograph and this is what you get. Unfortunately what started out as a small split before we began succumbed to the rough and ready treatment of a two year old boy. By the end of the transferring back and forward they were only good enough to throw in the rubbish. Even with dodgy chopsticks Master Oh does a great job. Still, when the bag is unpacked at the new house I know I have a ready made activity that is interesting and still challenging. And now trips out for Yum Cha just require me to pack a pair of these and we’ll all be able to feed ourselves. Hurrah. Following on the successes of her younger brother, Miss Oh Waily had to have her turn too. 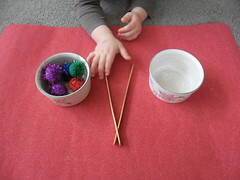 Mr Oh Waily, as you may recall, was recently in Singapore and one of the very nice little gifts he brought back for the children was a pair of chopsticks for each of them. Master Oh can handle them, but the are much harder for him than these flat bamboo ones. Here, though, Miss Oh Waily has new found skills. Meet Miss Long Legs. 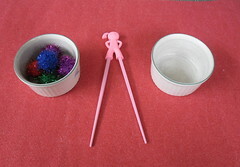 She’s Miss Oh Waily’s new set of chopsticks. As you can see she has been loved a little bit too much already. One ponytail bit the dust within hours of ownership. 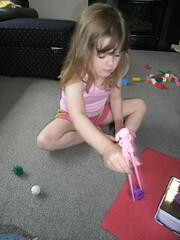 The second ponytail was taken care of by Little Brother a day after these photographs were taken. So she has had a short back and sides and is now like a pink version of Little Brother’s Master Long Legs. As you can see below, Miss Oh Waily is still showing lots of ambidextrous skills. She definitely writes with her left hand, but everything else is up for grabs. 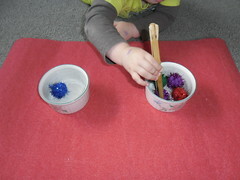 Left hand skills here were stronger than right, but both were still capable. 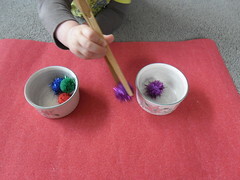 And once a younger brother decides to use the pom poms as confetti, this apparently can turn into a useful skill instead of doing it the boring way with your own fingers.